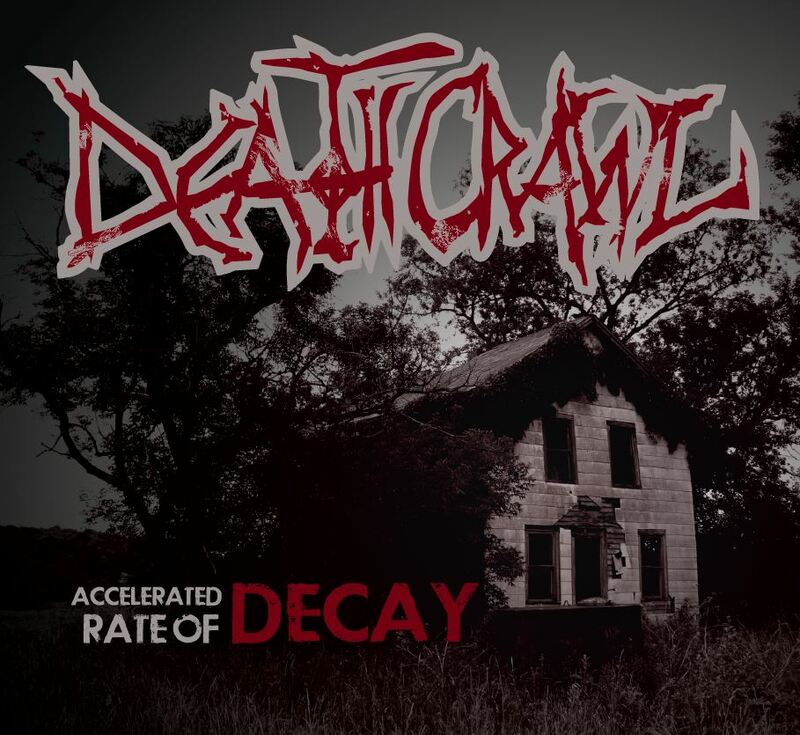 If ever there was a band whose name sounded exactly like their music, that would have to be Deathcrawl. I’d first become aware of these guys back in October, when I learned that they’d be playing a show in Lakewood, Ohio, with one of my personal favorite bands, Vulture. They describe themselves as “apocalyptic sludge” and “a pummeling soundscape of failure, apathy, and violence.” Based on that description — and some very complimentary feedback from the Vulture crew — I knew this was something I needed to check out. Right around that same time, the band came out with its second full-length release, Accelerated Rate of Decay. So I got myself a copy of that, immediately fell in love with it, and have really been digging it ever since. The entire time since then, I’ve also had plans to write about it and share the goodness with all you wonderful people who are reading this — and I am truly, sincerely sorry that I haven’t gotten around to it sooner. Because that’s like seven months you’ve spent not listening to this album, and I feel like it’s entirely my fault. Hopefully this will make up for it, though. At least a little bit. The first sounds you hear (the introduction to opening track “Burned Out”) really set the mood for the remainder of the album: feedback and noise and something that resembles air-raid sirens. A harsh, apocalyptic vibe that brings to mind darkness and destruction and death. These are themes that remain prevalent throughout the whole record. The vocals range from ghoulish harsh whispers to full-on acid-gurgling snarls. Often at the same time (all three band members share vocal duties). The image of rotting and decaying flesh, of something not quite dead yet but agonizingly close, definitely comes through. And this suits the lyrics just fine: some of the highlights include lines such as “Despite our best efforts / We ruin everything” (from “Despite Our Best Efforts”); the repeated title of “Kill or Be Killed”; and especially the staccato, unison-shouted, line from “Blight” (which, by the way, was the song that happened to come up on my MP3 player in the story at the beginning of this article): “THIS– WILL– BE– THE– DEATH– OF– US– ALL // THIS WILL– BE THE– DEATH OF– US ALL // THIS– WILL– BE– THE DEATH OF US ALL // THIS WILL– BE THE– DEATH OF– US ALL! !” Even when the band uses clean vocals — for example, in much of “Disturbing the Earth” — they still have a dark, nearly-lifeless quality to them, often harmonizing in a way that’s almost-but-not-quite consonant, feeling practically devoid of energy or emotion. Musically, sludgey guitar riffs and (often) slowed-to-a-crawl drum beats accentuate the bleak and hopeless atmosphere. Great, cool riffs are found all over the place here, from where “Burned Out” kicks in, all the way through about the last minute or so of “Lucifer’s Hammer”, where everything dies away to return to a noisescape similar to the opening of the album. In between, one of the things the band does especially well is dropping the tempo suddenly: this happens around the middle of “Burned Out” and just after the introduction of “Blight”, and it isn’t exactly like someone suddenly put the brakes on — but more like downshifting from fifth gear to maybe second, where the slowdown is far more immediate and is accompanied by a physical jolt to the whole body, and where everything seems to be working that much harder (and consequently, sounds that much heavier). About halfway through “Blight”, the tempo starts grinding down even further, until it has completely gone from a crawl to a dead stop. Particularly slow tempos are employed throughout most of the songs “Dead is Dead” and “Disturbing the Earth”, to great effect. Finally, scattered throughout the album are some other little embellishments that just add a bit more atmosphere; an additional dimension, if you will, to the grim picture that’s being painted. This is due to the inclusion of various synth sounds in some places — such as the intro to closing track “Lucifer’s Hammer” and near the end of “Disturbing the Earth”. But I’m not talking about some kind of cheesy strings or anything like that — these are raw, unnatural, analog-sounding synth noises that bring additional textures and grit into the mix. Stuff like angular, sawtooth waves; walls of unpleasant noise that swell to the point where they threaten to swallow the song whole (and the listener as well); and, in one case, some strange space-age sounds, not entirely unlike the introduction that precedes the song “Jet Airliner”. So anyway, here’s the situation. 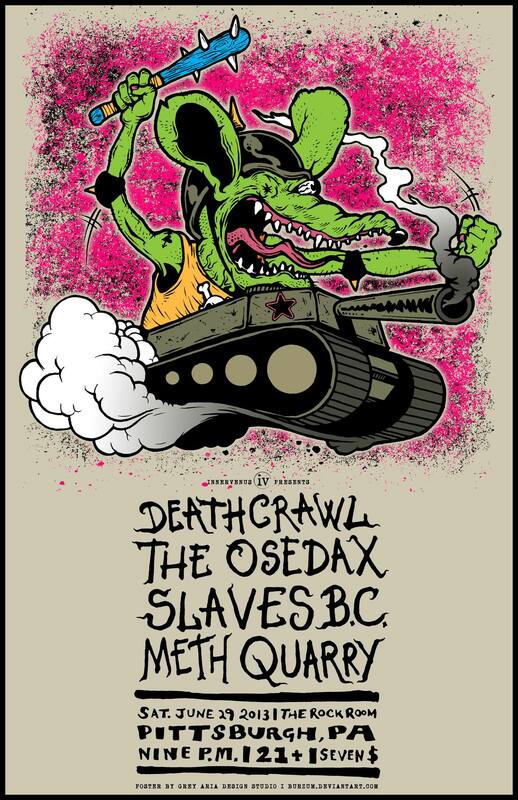 Deathcrawl will be appearing in Pittsburgh for the first time ever, TOMORROW NIGHT, the 29th of June, at the Rock Room. Now that you’ve read about their music, I’m sure you’re dying to go see this show — and I assure you, the rest of the line-up is totally solid as well. Bring ear plugs, that’s all I’m saying. This entry was posted in Reviews, Shows and tagged Cleveland, Deathcrawl, Innervenus, Josh Thieler, Lakewood, Meth Quarry, Ohio, Pittsburgh, Slaves BC, The Osedax, The Rock Room, USA, Vulture. Bookmark the permalink. Breaking News: TrollfesT Begins Work On Another New Album!